The SMS Text Destination allows you to send data from your forms in text format to various different phone numbers. Multiple SMS Text Destinations can be added to a form, and multiple phone numbers can be included in each SMS Text Destination. We'll give an overview of setting up this Destination below. Once you’ve saved your form and exited the Form Builder you will arrive back at the "Forms" page. 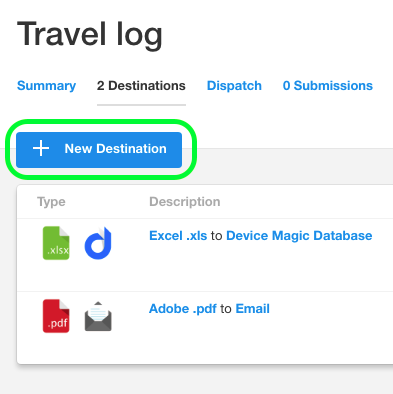 On this page, click the link in the Destinations column of the form you would like to add the Destination to. 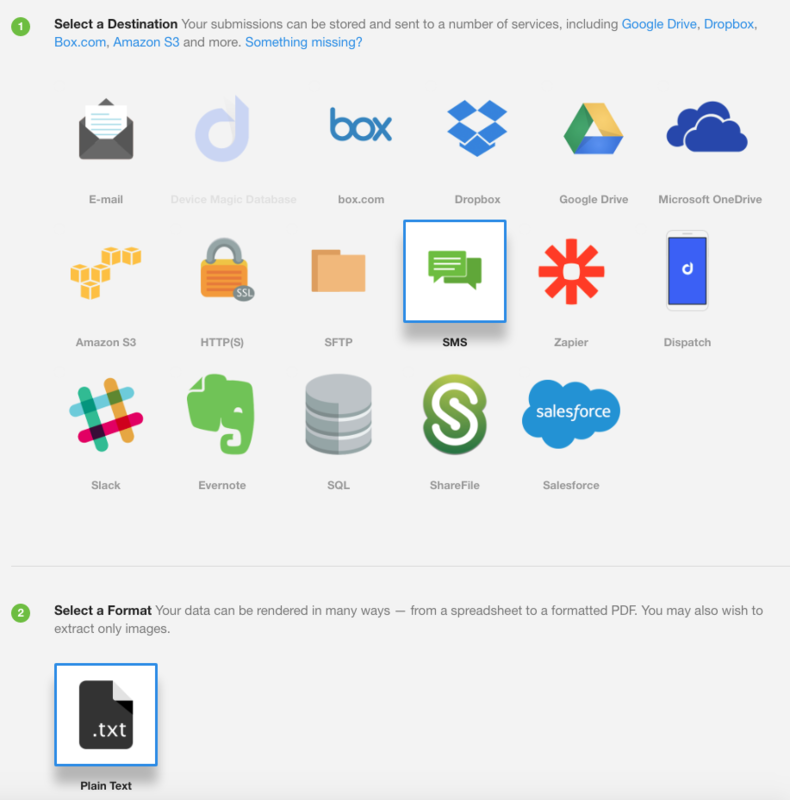 A new page will load, and on it you will see different Destinations to send your data. In this example, "SMS" has been selected. After selecting the Destination, choose the "Plain text" format. Next, you will see the "Plain Text Options". 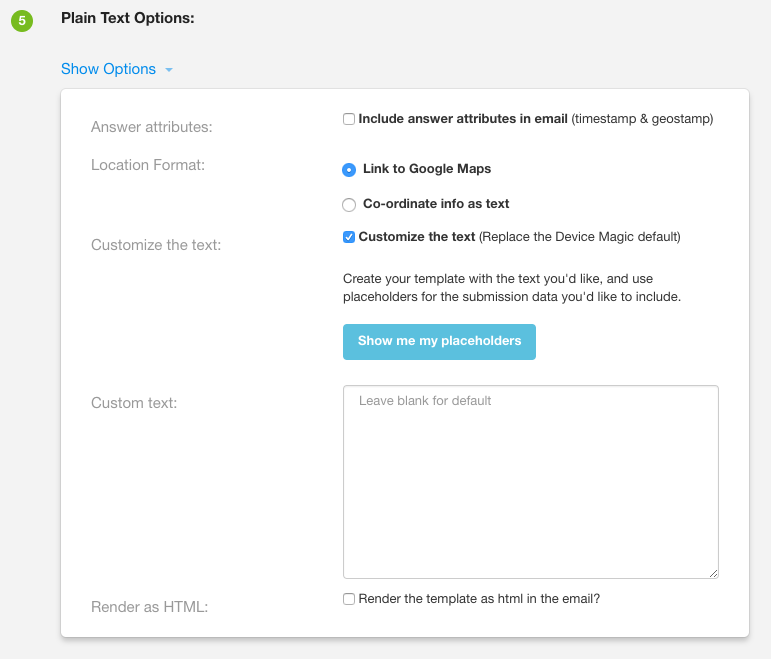 Open this section by clicking "Show Options" and check the box that says "Customize the text" if you would like to change the Device Magic default text and enter in a custom message. You can also include placeholders for questions in your form in the body of the text. By clicking on the blue button that says "Show me my placeholders", you will see all the placeholders applicable to your form. At the bottom you can choose to have the template rendered in HTML. Beneath that section, there is the "SMS Options" section. Here is where you add the phone number(s) where you want your submission data sent. You can type in a phone number (starting with the country code), and you can choose to have the SMS text sent to a phone number specified by an answer in the form (if you have a phone number or free text field in your form). Lastly, you have the option to set Destination Rules on when you want the SMS text to be sent based on criteria from your form. This completes our overview of the SMS Text Destination. If you have any questions or comments feel free to send us a message at support@devicemagic.com.